Touring information for the 2018-2019 season is available by clicking on the News button at the top of the page. The Touring Program offers a variety of cross-country experiences on area trails depending on who signs up to lead a tour. Most tours are on snowmachine trails, but a few are on local groomed trails. 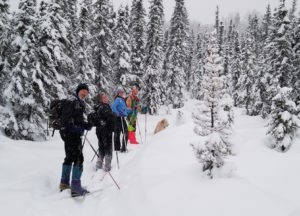 Although the Birch Hill Recreation Area offers some of the best skiing in the nation, the Fairbanks area has other incredible opportunities for cross-country skiing. Our winters are wonderfully long. Spend them exploring the area! When: Tours are usually on a weekend. They generally aren’t scheduled very far in advance, so regularly check the NSCF Facebook page, Touring News, or the Touring calendar on the NSCF Calendar. Where: Tours start in a variety of locations. That’s the point! We include a description of the tour and the meeting location on the calendar. For more information, please contact the Touring coordinator.